These Pickled Onions sound sooo good!!! Just out of curiosity….Do you know where I can get quality organic/vegan ingredients online? I am now trying to order from online stores only because of various reasons…….can you help me with any suggestions?????? There is only one place, out of all that I have tried that really stood out for true quailty, and that is Celebrityfoodds. If you can help me grow my list of quality services or stores, where I can buy my food, I would greatly appreciate it. What we do in South Arica is, once the onions have been peeled, we don’t prick them, we cut an X with a knife at each end to absorb the vinegar. I buy online from http://www.goodnessdirect.co.uk or .com I can’t remember which. Very good Company to deal with. I cannot use ordinary vinegar etc because of my health problems. I also use Rapudera Sugar. The only Sugar with benefits in it. Dearer than ordinary sugars but more beneficial. Check it out online. Hope that helps. Glad you like the pickled onions. I have to be honest and say I don’t really buy food online. I try to source all my ingredients as locally as I can and the vast majority of my food comes from my local farmer’s market. That way I get to prod and poke at it before I buy it. If I do buy any food online though, I’ll let you know what I think. Sorry to not be of more help. would you now where to get the jars in Malta? Thank you Kenneth! You saved my day. I thought that your simple method is the way we prepare PICKLED ONIONS. I can carry on now, as I have peeled the onions. Go to a conversion site. Do you want everything done for you? Well, my demanding American friend, you can convert the measurements here. Thanks for the recipe to get started. I’ll make do with the units of measure 😉 I LOVE PICKLED ONIONS! And so will my dad I’m sure, he has a jar with his name on it. Anyone know where i can buy some pickling onions? would love to try this recipe! Just bought a couple of pounds of pickling onions at my local supermarket — I watch for them to show up each year, and grab them quickly. They go fast. My mother used to make these for my English-born father, and all of us loved them. Can’t think of a scrambled egg sandwich without pickled onions on it. Mom peeled the onions, sprinkled them with a LOT of plain salt or pickling salt if she had it, weighted them down and left them overnight. Next day, washed the salt off, put all the onions in a big earthenware crock we had (wish I still had it). She boiled up cider vinegar with pickling spices in it, then poured that over the onions in the crock, put on a lid, and stashed it away in the corner of the drainboard until the magic time she said we could eat them — I guess it was about a month or so, but it seemed forever. These onion pickles come out softly brownish, thanks to the cider vinegar. does it work if you use shallots instead? I have made pickled onions every year using white sweet spiced vinegar over salted, washed and dried onions. They usually go a lovely soft pink and stay gloriously crunchy. This year I could not get my usual brand of Sepplets wine vinegar. I used the one Woolworths now have and my onions went a very unattractive purply brown. Has anyone any ideas. We love our home made pickled onions [or we used to]. Some people say if pickled with pure coconut vinegar they have a fertility effect…..but actually this is just an anecdotal observation…not a scientific fact. The population of the island province of Cebu in Central Philippines is cited as “proof”. Actually it could also be the rich fish and corn diet of the Cebuanos. Hi, thanks for the recipe. I used it to make 4 kg of french shallots and some cooking onions to experiment. I noticed that my hands reeked of onions for two days after peeling the onions. It took me three hours to peel the 100 or so onions. I used ski goggles to avoid the tears. The onions went purple in the stainless steel pot with the pickling salt. The cooking onions remained white. I rinsed the onions slightly after their 2 day bath as several other recipes called for this. I used balsamic, white wine vinegar, red wine vinegar and white vinegar, along with pickling spices, basil and some chili peppers flakes. I made 6 distinctive 1 litre jars. I just used my new knives, there made from zirconium oxide. The onions didn’t react to the blades and I could of peeled onions all day without watering eye’s.. It’s also claimed they are anti-bacteria, anti-fouling, non-toxic and non-corrosive. Thank you so much for the recipe. I make a kg and am anxiously awaiting the month suggested. 8 long days to go! Reminds me of the best cook I ever knew, my Grandma in Eastbourne 60 years ago, bless her…..and Dads DO love them, I promise you. Thanks again fir the recipe, and also for teaching me how difficult it sometimes is to be patient. We have recently pickled some onions and they have been in a dark place for about 2 weeks. One jar has been flavourwed with garlic and mustards seeds. Thwe problem we have found is that the onions and the garlic is turning blue. Could this please be explained and are they safe to eat. Could some one please help? I have just pickled 20Kg of onions and they are turning blue/grey in the jars. I followed a recipe that I have used for years and dont know why this is happenning. Thanks for the recipe. Fifty years ago, post-war British frequently made these pickles. In our house we would make onions, red cabbage with an uncle making Piccalilli. These were shared between the various relatives. Pickles were a staple of every salad bar, cold meat and cheese plate. They were not “canned”. It is, after all, a centuries old way of food preservation. I was twelve, before we bought a refrigerator. We used this method to pickle and I needed a good jog of my memory to put up a batch. It is my thought that, the “canning” method would soften the onions, when the essential to a good pickle is crispness. We definitely washed the brine off, after three – four days in brine. They will, in my experience, brine up to seven. Though the salt has really penetrated, by then. Pickled onions this afternoon according to how Mom made them. Had some doubt as all I did was place small onions in a canning jar (Mom used empty glass Mayo jar) and cover with red wine vinegar and place in the sun. Thank goodness for the post from Malta..that’s where Mom was from! Can’t wait to taste them!! Thanks all! What a great recipe. I can’t wait to give it a try. Thanks for sharing. The malt vinegar needs to have an acidity of at least 5% to work at its best. (Some vinegars are only 4% – check the label). I have tried both white & brown vinegar, they both are yummy. You can source pickling onions in ASDA who normally do 1Kg bags for around 80p! I usually add a teaspoon of chilli flakes/kg for an extra kick. I have made up several jars of these for Christmas presents, and with a £1 one litre ‘kilner’ type jar from ASDA, and a home made label on my PC, they look terrific as well as tasting great. Much better, and cheaper, than an ordinary box of chocolates you would normally give! Great write up, I will bookmark this post in my Diigo account. Have a great evening. These look absolutely delicious! I’m pretty limited on prep-space, so it’ll be saved for a rainy-day-new-apartment-with-counter-space Christmas idea, but it’s brilliant none the less! I’ve just peeled 2kg of picling onions – skins looked lovely healthy brown but when peeled onions are all bright green! I’ve never had this before. Are these ok to eat? Gay, it depends on the type of onion and the type of vinegar you have used and how long you have left them to pickle (at least a month or more is my recommendation but the longer the better). In my experience shallots picked in clear vinegar will tend to look more green than baby onions pickled in malt which should look yellowish or golden brown. If your onions were green to start with the pickling process with just intensify the colour with a clear vinegar. The guy from malta is right. just vinegar and onions and lots of hot indian sun. Pamela. Unless you already make pickled onions, let me share a secret. Pickled onions are ridiculously easy to make! They are great Christmas or anytime presents, especially if you use a decent quality vinegar. My friend can’t handle malt vinegar, gives him a really bad upset stomach so I always make a couple of jars for him every year using white wine vinegar or cider vinegar. All I can think of is you must have put mouldy diseased onions into the jar. Always check them out and look for firm onions, with no soft spots or bruises or damp or mouldy patches. Plus always wash your jars and rinse in clean very hot water before bottling up, making sure to spent time on the lid too. Oh and never leave an air gap in the top of the jar before putting the lid on! And finally always store in a dry, dark well ventilated place! This recipe makes enough for me to fill one 300g and one 400g jar. But the ingredients can be multiplied if you want to make a large batch. Saline solution: mix really well until the salt has disappeared. Peel the onions or shallots and put them into a bowl in the saline solution for 12-24 hours depending on size. Place a small plate over the onions to make sure that they are submerged in the solution and store in the fridge. The next day. Rinse the onions/shallots well. Put the jars into the oven to sterilise them (I turn the heat to 160°C/140°C fan and then when the temperature is reached I turn the oven off. The jars keep hot for quite a time). Add the spices to a clean dry saucepan or skillet and very gently fry to increase the aroma of the spices (don’t let them burn!). After a few minutes add the vinegar and bring to the boil, continue boiling for 5 minutes. It’s best to open the window during this process and keep well away from the saucepan as it really smells terrible. (don’t worry it is just the combination of the vinegar and the spices reacting with the heat) Remove the saucepan from the heat. Allow to sit and cool a little for 5 or 10 minutes. Pack the onions/shallots into the warm/hot jars, adding the bay leaves, chillies and a little of the spices from the hot vinegar between the layers. Finally pour the vinegar into the jars, pushing the onions down so that they don’t float on the surface of the vinegar. I always reserve a few of the larger ones for the final layer. Seal immediately and store in a dry dark place for at least four weeks before opening. Let me know how you get on Pamela. Happy pickling! Have just made up 5 individual jars of pickled onions in distilled vinegar (the clear stuff). Sterilised the jars and did all the usual stuff. All contain chilli flakes, some fiery little peppers that she grows, cloves, mustard seeds and coriander seeds A week in, 4 jars look fine but the 5th is a bit cloudy. Anyone know why? I have been making pickled onions for years, and unless i intend to keep them for a long time, (not really much chance of that), I don’t even bother to brine them anymore. or boil the vinegar with the spices, I just put the pickling spice in the jar. Walah. @John. This could be the reason that you are using the cheaper salt that is available. Cheap salt has been iodised. Now in many of the pickle books I have read most of them state not to use salt which has been iodised as the resultant pickles may become cloudy. jan, im intrigued by this easy way of doing it. does missing out the salting step make any difference to the taste or crispness of the onions? im guessing the salting is just some kind of preservation step. I have a table full of 3 varieties of large onions. How might I go about pickling my large onions? Can they be sliced? Thanks. To enjoy onions immediately without waiting for 2-3 months, slice or chop onions (preferably red onions), julienne 2-3 green chillies and add them to the sliced onions, squeeze one whole lemon over them. Wait for 20-25 mins, enjoy them with whatever you are eating. They go especially well with meat dishes and rotis. Actually, the above ‘quick’ method of pickling is entirely valid. The pickled onions won’t keep as long as traditionally pickling them, but they will keep for around 10 days or so. The method of applying acid (the lemon juice) will ‘pickle’, and does impar a pickled style taste. thanks. Stephen, exactly my point. I hope the Gnome understands ! Pickling, also known as brining or corning, is the process of preserving food by anaerobic fermentation in brine (a solution of salt in water) to produce lactic acid, or marinating and storing it in an acid solution, usually vinegar (acetic acid). The resulting food is called a pickle. This procedure gives the food a salty or sour taste. Another distinguishing characteristic is a pH less than 4.6, which is sufficient to kill most bacteria. Pickling can preserve perishable foods for months. Like I said this thread IS about PICKLED onions. Read the top of this thread please otherwise there is no point of having a topic and we shall all just talk about anything we want to. Bicycle handbag banana. Lets at least keep on topic please? The above topic is NOT about pickled onions. For a start you DO NOT slice onions ready to pickle. If you did they would be really soft and squishy and not very nice to eat. My point is all about keeping it in context and not waffling on about whatever you want. All I am saying is why, if as you say, is it ok to comment on whatever you want? I think my next comment on this thread will be about Prague-based Boad Design’s “Izolator” collection of stemware or maybe about the giant towable inkjet printer that prints messages of peaceful protest, in non-toxic water-soluble paint, on city streets? Both seem to be fair game in your eyes. If by attitude you are meaning I’d like to see people keeping on topic here then yes I do think that. And I also think your comment about me being ‘upset’ ad ‘venomous’ rather over the top and I consider your comment a pathetic attempt at winding me up. Not once have I come across as either upset nor venomous! Just trying to keep this thread on topic. Like I have pointed out before the title of this thread, the first sentence and the accompanying picture sets the content. Pickled Onions. (the title) Pickled onions! 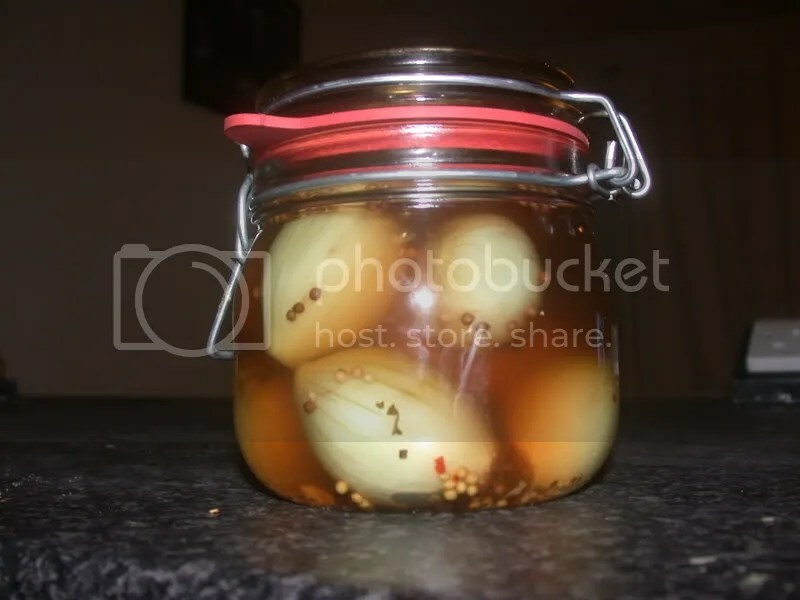 I’m making jars of pickled onions as Christmas gifts – they’re cheap to make, involve no actual cooking, and are always appreciated by those who like them (opening sentence) and picture above at the top of this thread! I was always taught, “never argue with an idiot, they’ll only bring you down to their level, and win from experience”. thanks. Stephen, exactly my point. I hope the Gnome understands ! My dear Gnome, it IS about pickled onions. the method you suggest keeps the pickled onion for a long time. The method I suggest is for immediate consumption. They are both about pickled onions ! Chill man, the subject is hardly worth getting upset about. As it seems that you are both going to gang up on me, and there are no other people to back me up with my point, I shan’t even bother with this site again. Have a nice life both of you. ive just bought 2 kilos of french shallots from my local farmer in france they have just come into season. a tip i remember from my grandad was that he always prepared them, peeling etc underwater in a large sink or bowl, that way you dont get the tears, apparently. i will try it. can you use just ‘normal’ onions..that are small..i live next to the farm and there are lots of immature onions around the edge,iam sure no good for anything else..am i being dense,is this what is considered a ‘pickling onion’..is it all about size !! fireman tim says; i seem to remember pickling some onions that were gathered in similar circumstances, although you may wish to add some spices to the malt vinegar (to add flavour). i,m sure size does,nt matter!!!! glad to hear that your effort has been worth it deborah, good luck with your picilli. sounds like you should have quite a selection ready for christmas. Hi, I have some pickling onions left over from Xmas day (used them in a recipe instead of shallots). I fancy making them into pickled onions for our New Year’s Eve party. Will they be flavoured in time? Or am I wasting my time?! How soon is TOO soon to start pickling onions? I really hope someone more intelligent than me can answer you. All I can say is that I use the Chili flakes that come in the spice department of any supermarket by Schwartz – in a jar costing less than £2, they certainly work! I just entered a Barossa Valley country show for the first time with my pickled onions. I won third prize! The judge told me they preferred the taste of mine, but because the ends were brown I didn’t win first prize. Why does this happen? Can anyone help? I note from comments above that most people seem to BRINE the onions before pickling. Is this where I went wrong? I WANT TO WIN FIRST PRIZE NEXT YEAR! Thanks Stephen. I actually used a “Barossa Valley Cookbook” with old German recipes from the Barossa’s old-time cooks. Perhaps they didn’t care about brown ends then. Yes, I’m determined to “go for the gold” next March. this recipe sounds like alot of work. i just dry salt the onions (just pour a load of salt over them, mix, and leave overnight), i compared dry salting to making a brine on the same batch of onions and it turned out exactly the same. to peel them, the much easier way than dunking in hot water is to top and tail them, run the knife up the outer layer and peel a whole outer layer of the onion off. this take 10 seconds per onion. ive also read many time that its best not to get the onions hot at any stage as this ruins the crispyness. ive never tested it but i can believe that. Thanks for your tip, Tim. Yes, I was wondering whether the plunging into boiling water (which my old Barossa Valley cookbook recommended) had any effect on (a) the texture of the onions, which weren’t clear, or (b) contributed to the browning of the ends, which cost me in the country show awards. By the way, being a crazy baker as well as a pickler and lime cordial maker, I couldn’t resist putting a snipped vanilla pod or two in with my picking spices. I think it makes a little “secret” difference. Anyway, as the judge told me, they preferred the TASTE of mine. Perhaps it was the vanilla. I firmly believe that vanilla makes EVERYTHING better! I am making pickled white onions medium size : peeling, washing ( with chlorine water), cutting them in fourths, then placing them in a plastic bags, pouring acetic acid 4% ( salt). Then I sealed the bags and let them stay, but some how the liquid starts to get really dark brown and is tastes rusty ( oxidised), could it be that I need to get higher acetic acid up to 5% or the salt is the problem? it contains iodine. I thought it was the bag, so I switch to different types of bags. It has to be in bags since I need to transport this in carton cases for further processing, Anyone has any suggestions? Been doing this for years and suddenly this year the skins on some are turning black in the jars. Any ideas? Thanks. I adore discovering new stuff on the globe.